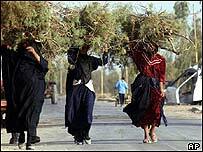 Environmental activists have demanded a clean up of radioactive waste in villages surrounding Iraq's Tuwaitha nuclear plant as fears grow for local people's health. Campaigners from Greenpeace say they have found abandoned uranium "yellow cake" scattered across the local community, after the plant just south of Baghdad was looted during the recent US-led conflict. On Tuesday, protesters carrying banners condemning the "nuclear disaster" handed over a large canister still containing significant traces of uranium to US troops stationed at the plant. Locals said the canister had been left in an open area for more than 20 days. "If this had happened in the UK, the US or any other country, the villages around Tuwaitha would be swarming with radiation experts and decontamination teams," Greenpeace International's Mike Townsley said in a statement. "It would have been branded a nuclear disaster site and the people given immediate medical check-ups." Greenpeace also warned that it had heard several reports of locals suffering from "unusual sickness" after coming into contact with items from the plant. Radioactive readings campaigners had taken in one local house had been as much as 10,000 times the normal, safe level, they said. 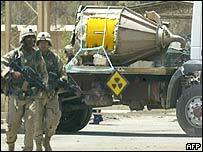 There have been other reports of Iraqis suffering from symptoms associated with radiation sickness. "No one cares about us. We are dying slowly. Our whole neighbourhood is contaminated," Tuwaitha city council member Tareq al-Obeidi told French news agency AFP. "We need medicine and good hospitals. Removing it from the garbage is just the beginning." Radiation sickness can lead to nausea, vomiting and diarrhoea, and more serious problems such as respiratory problems, skin disorders, haemorrhaging and anaemia. In severe cases, death can occur in two to four weeks. The Tuwaitha facility was heavily looted during the recent conflict in Iraq. The UN's nuclear watchdog, the International Atomic Energy Agency (IAEA), had warned that the site would need protection. But by the time the site was secured by US troops in May, much within the facility had been carried off by Iraqis. The IAEA has since been in Tuwaitha trying to account for the missing nuclear material, and says most of the uranium has since been recovered. But Greenpeace says that the IAEA must be given a "full mandate" to monitor and decontaminate the area.